MAGIC MENDER is the low fire version of MARX AZTEC HIGH FIRE MENDER. 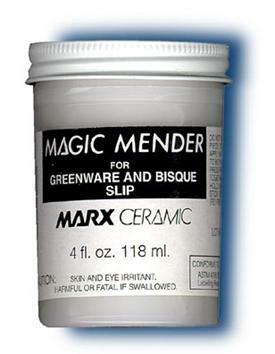 MARX MAGIC MENDER is recommended for LOW FIRE ceramics, greenware and bisque. It is recommended for repairs, add-ons, attachments etc. MAGIC MENDER is pre-mixed so there is no need to add slip. For greenware remove excess immediately with a semi-dry scrubby. For bisque let the Mender dry completely then claen as you would greenware..
Make sure that the mender is completely dry before firing. Fire at the temperature recommended for the slip (up to cone 02/03 ... 2048F). MARX MAGIC MENDER must be fired to become permanent. • Magic Mender is for ceramic greenware and bisque for temperatures up to cone 03.